Total Chlorine and Free Chlorine dual test strips are used for testing drinking water from city water treatment systems. This dual test is a convenient way of monitoring Total and Free Chlorine. Background information on this test # 130 Total and Free Chlorine in Water is available as a PDF download. 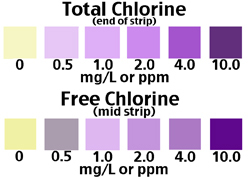 Total Chlorine and Free Chlorine test strips are used for testing drinking water from city water treatment systems.